Based on the Frog Prince fable by the Brothers Grimm, the Frog Story video pokie from EGT should have punters hopping to the reels and hoping to make others green with envy when they land some of the big prizes on offer, including a 4-level progressive jackpot. There’s a standard 5-reel layout, where the symbols are in 3 rows and 20 fixed paylines run from the left side. The game features some of the main characters from the original story, such as the wizard who turns the Prince into a frog and the beautiful Princess who breaks the spell with a kiss. The whole game has been designed with care and the bonuses can bring about a fairy-tale ending to a spin of the reels. 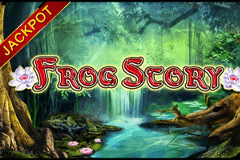 Wild substitutions, huge awards from a scatter symbol and a Topping Reels feature, where extra spins and multipliers are awarded, all combine to make Frog Story one of the top games in the EGT range. Prospective players will want to review the pay table, just to see how everything works, and once they have reddit, the next job is to decide how much to stake per spin. The low limit is set at 0.20, although free Frog Story video pokie games are offered, so they can try it out before making real-money wagers. Playing card symbols will tend to appear quite frequently, creating the smaller winning combinations when 3, 4 or 5 land on adjacent reels across a payline running from the left side. The J and Q return 5, 15 or 50 coins, while the K and A are worth 5, 25 or 75. Picture symbols start with a treasure chest and go up in value through the potion bottles to the Princess and a Robin Hood type character. The most valuable standard symbol is the Wizard and he pays out 5 coins just for magically appearing on reels 1 and 2, while 3, 4 or 5 Wizards are worth 25, 150 or 3000 coins. A castle scatter symbol can stop in any positions, and when 3 turn up, the payout is equal to 100 coins, but the best prizes come from 4 or 5 scatters, which are worth 1000 or 10000. Any symbols that make up a winline will vanish, which leaves empty spaces for any above to drop into, and new symbols will fall down from above the reels, potentially creating further winning lines which will in turn disappear. This process can continue several times and with each successive Topping Reel win, an increasing multiplier will be applied. It goes up by 1x for each sequential win, and EGT don’t actually specify a maximum, so very fortunate players could be in for some big bonus rewards. The Frog turns up as a wild symbol and this cute character can land on reels 2, 3 and 4, expanding across them whenever he does so to help complete winning combinations, although not in the Topping Reels feature. It also won’t be able to act as the scatter symbol, perhaps because the potential winnings from this are so substantial. All EGT pokies give players the option to play a double or nothing gamble game with wins below a certain level, which is set at 700 coins in Frog Story. To win the gamble, they will need to correctly time a click on red or black buttons as a playing card rapidly alternates between the colours, and of course a wrong pick loses the triggering win. The other common feature is the Jackpot Cards progressive game, that begins at random. Either of the Club, Heart, Diamond and Spade jackpots shown above the reels will be won, and all that players need to do is click on upturned playing cards until 3 of a suit are revealed, claiming the relevant jackpot as soon as they have found them. Online casino pokie players sometimes have to kiss a few virtual frogs before finding a game that really suits them, and Frog Story could be just the one that fits the bill. The Topping Reels feature is perhaps the most interesting, as it happens with every winning spin, but the potential to gamble each win, and the progressive jackpots can bring a fairytale ending to a game.